Oysters have been consumed by humans for centuries. They used to be an important food source in coastal areas. Pollution and overfishing have considerably reduced oyster supplies, but oysters still remain a popular delicacy. Traditionally, they are considered to be an aphrodisiac. 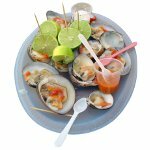 Oysters are rich in zinc, calcium, iron, selenium, vitamin A, and vitamin B12, but are low in food energy.